The BARTEC PIXAVI Impact X NC (No Camera) intrinsically safe smartphone has all the functionality you will expect from a high end smartphone, with the exception of camera functionality. The IECEx and ATEX Zone 1 certification has not compromised the quality and usability. The device is explosion proof and rated for use in hazardous areas. The Impact X NC (No Camera) version is the only smartphone where all cameras are physically removed from the device during production process to ensure that it is impossible to take images or video with the device. NB! The Impact X NC is an intrinsically safe device, intended to be used in hazardous areas in various industries such as oil and gas, shipping, pharmaceutical and petrochemical. It is not intended for personal use. The Impact X NC (No Camera) intrinsically safe smartphone is a very powerful product, both on the inside and on the outside. It has the latest processors and software. Rugged, waterproof, lightweight aluminum chassis, as well as ATEX and IECEx Zone 1 certification makes it the most versatile smartphone ever built. If you are looking for the normal version of the Impact X (with cameras), you can find it here. Ruggedized and Ex certiﬁed products have been synonymous with low performance, outdated technology and bulky form factors. We wanted to change that! Our customers came to us and said they wanted the same performance and form factor in their Ex certified devices as in their consumer devices. The Impact X NC version have all cameras removed. 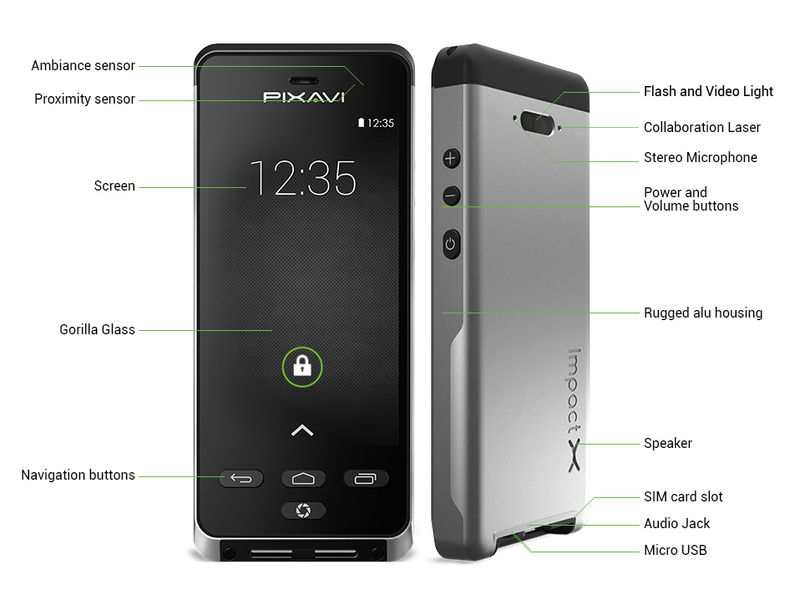 We designed the Impact X smartphone with hazardous industrial environments in mind, battery lifetime, ruggedness, usability, sunlight readability and glove compatibility is essential. The Impact X was developed in cooperation with Shell and other leading O&G operators. The high end materials, custom buttons, high end processing power and Android operating system ensures that the device can be used for a wide range of tasks. The device is lightweight, it has anti smuge coating on glass, dedicated buttons, glove compatible touch screen, moisture immune touch screen, ergonomic grip and hand strap makes it useable and ergonomic. BARTEC PIXAVI is the only IECEx and ATEX certified smartphone vendor which have complete control over the entire production process, this means that we can easily remove the cameras during production to ensure that the smartphone is unable to take images or video. The smartphone will still be IECEx and ATEX Zone 1 certified for hazardous areas. This is a requirement in some areas and companies for security reasons. Simply removing the camera in software is not considered to be a sufficient solution for most customers. The Impact X ships with the Collaboration X Mobile device management solution. This allows you to simply and securely manage the mobile devices from a network administrator point of view. Collaboration X allows you to set security policies, access control, network policies and other settings as well as wipe devices if they are lost. All of this can be done securely using the simple web interface. Collaboration X allows the user to have complete control over a large amount of devices in a network. The Impact X is packed with advanced technology in order to offer the best possible performance. Modern mobile processors ensures snappy performance and the lowest possible power consumption. The aluminum chassis, sunlight readable display, extra memory capacity, rugged strap mounts and gorilla glass is designed for the end user in mind. 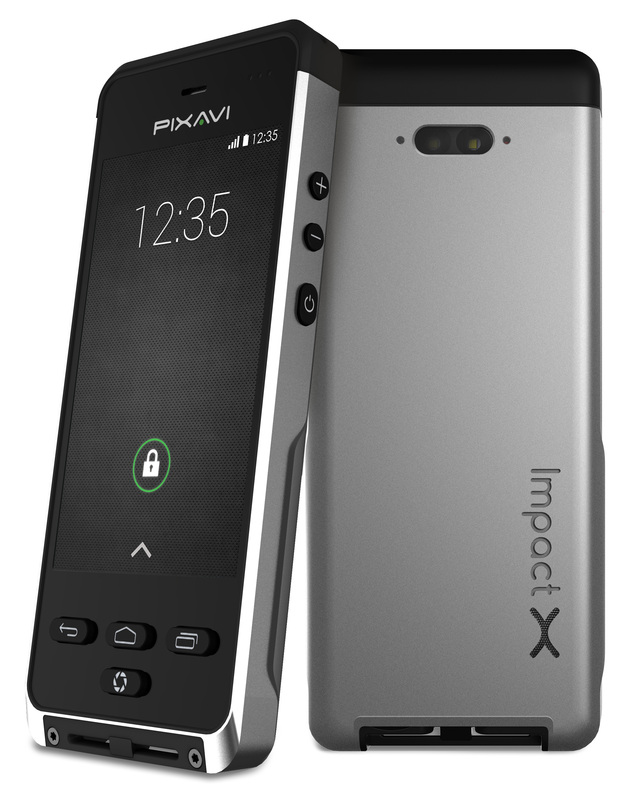 The Impact X also has double the battery capacity (3000mAh) compared to other smartphones, to ensure a full workday with active use. Android is the preferred operating system for mobile devices. The reason is simple, running Android, the Impact X is secure, stable, updated and you have access to a huge library of applications. Bring any app into hazardous areas, including a wide range of value adding applications and services, such as mobility and ERP solutions, device management, video conferencing applications and every other Android app. Today’s workers expect the same snappy performance in their enterprise apps as they do at home when playing Angry Birds on their personal devices. The Impact X can help organizations realize their mobility strategies by offering the horsepower to run any App developed for Android. For example service and maintenance apps, video recording and viewing, barcode reading, ERP, RFID and mobile device management to mention a few. This means new usage scenarios and applications in many industries. Using smart technology allows user to troubleshoot and assist workers over distance. Work smarter and solve problems remotely, without having to send experts and technicians to the site. This saves travel cost and time. This device as an enabler for many smart innovations within hazardous areas. It gives the user an unprecedented versatile and powerful platform, ready for future applications. Hands-free operation is often required when working in the hazardous area. This is why we have developed a wearability kit that enables Impact X to be mounted on a wrist cradle, wall mount, or telescopic pole. The result is a completely wireless and hands free mobile worker kit.